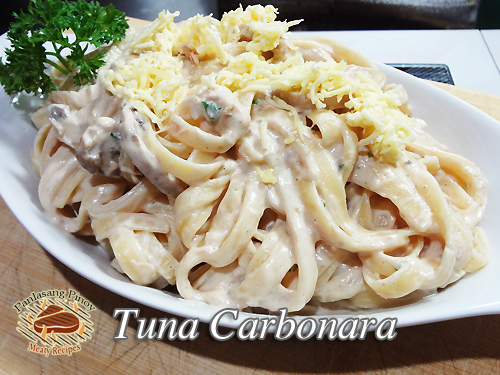 This recipe is an improved version of the simple tuna carbonara recipe. Three additional ingredients I think is what makes this recipe stands from the rest. The butter for sauteing, cheese and parsley. Don’t forget those three ingredients as much as possible and if parsley is not available, you can omit it but it taste really good with parsley. And also don’t forget the cream of mushroom soup. You can buy condensed cream of mushroom soup in cans like Campbell’s which is recommended or you can use the dehydrated one sold in sachets like the Knorr cream of mushroom soup but you have to dissolve it in water before adding it to avoid lumps. When buying tuna in cans, buy the tuna solids or chunks because it contains more fish meat compared to tuna flakes. And in my experience, tuna solids has a more desirable texture compared to flakes. Whether in brine or in oil in my opinion does not matter because it taste the same. When the tuna is in brine, you should drain it first because the brine might be too salty if you include when making the sauce. This recipe is an improved version of the simple tuna carbonara recipe. Three additional ingredients I think is what makes this recipe stands from the rest. In a deep pot put the 1 liter of water and bring to a boil. Then add salt and cooking oil to prevent the pasta from sticking together. Put the Spaghetti or Fettuccine and cook according to the instruction on the package. Stir the pasta from time to time to avoid the pasta sticking on the bottom of the pot. Then drain the water from the pasta and fill the pot with tap water to prevent the pasta from overcooking. In a medium size saucepan, in a medium fire, melt the butter and saute onion and garlic until tender then add the sliced mushrooms. Stir fry the mushrooms until the sides are seared and a little brown. Then add the tuna and stir fry for 1 to 2 minutes and season with magic sarap, salt and pepper. Add in the milk, water, cheese, cream of mushroom soup and nestle cream and stir and simmer until the sauce boils. Continue stirring until the sauce becomes thick. Add the parsley and stir again for a few seconds. Turn off heat. Pour the carbonara sauce on top of the Spaghetti or Fettuccine and garnish with parsley and grated cheese. Regarding your creamy tuna carbonara recipe. How many servings will this recipe provide ? About 9 to 10 servings. But only 7 to 8 for people who have hearty appetites. False, this is not a carbonara recipe. Carbonara does not have cream. The creaminess is made by patial cooking of eggs. Do some research next time. That’s how we cook it and I’m just sharing our recipe. By the way what is “patial”? I do it with eggs too to make it thicker but sill need cream,, patial is a typographically typed word of someone who corrects other peoples works.. hehe nicw post men keep it up! authentic carbonara is made by partially cooked eggs but this is more of a PINOY STYLE carbonara. this is how we usually cook our tuna carbonara here in the Philippines, esp. at home. But if you do choose to eat carbonara in a restaurant, then you’ll be getting the authentic one, more often than not. Hi Sir dexter, ask ko lang po if kelan ilalagay hung calamansi and how many pcs po ilalagay kung isang kilong pasta lulutuin. It depends on you if you want to drain and discard the oil or include it in the sauce. Thanks for your comment. Are we going to put both nestle cream “AND” evaporated milk together? If iam going to cook half kilo, all the ingredients will be also be divided into two? Like for example 200grams of cream,for one kilo pasta, but i decided to cook half kilo, the cream will be 50grams too or what? Yes you just divide the ingredients to half. About the nestle cream, the medium size can is about 300 grams so find more or less 150 grams can. Hello, can I use any kind of canned tuna with oil? Thanks! Hi Dee, Yes you can use canned tuna with oil. Hi! Is it okay to use all purpose cream instead? How many packs do I need to use? Thanks! Yes you can use all-purpose cream and it depends to your taste how many packs you use. Try to use 1 pack first to be safe. Can I use any kind of cheese or is there a preferred type of cheese u use? We use ordinary cheddar cheese but you can experiment which suits you best. If you double the ingredients, I think it will be the same. can i used egg if i dont have nestle cream? egg yolk & evaporated milk. Hi Ceazar, I think you can. But I’m not sure how. You can make a little research on using egg yolks and milk. Some recipe I see only uses eggs and cheese. Yes! Me too. I tried this recipe and it is delicious! @Dexter, thanks for that additional info. I think you are right about adding calamansi to remove the fishy odor of the tuna. Thanks Ara for your wonderful comment. I’m happy that your children love it. Hi Mitch! Thanks for posting that wonderful comment. I’m happy your BF love it. Hi Don, thanks for the tip. Sounds like a good addition to the list of ingredients. Hi Delubyo,yes you can use lemon and amount can be a teaspoon for this recipe or more depending on your preference. Yes again it can remove the fishy taste or “lansa” of the fish. if i use a tuna flakes in oil,should i remove/discard the oil?or can i just mix it or use it for as substitute for the butter on the saute part?thanks..
Hi Sarah, there is no need to discard the oil from the tuna. Your can also use the oil for sauteing but I still suggest using butter even a small amount. i tried this last christmas and my family love it. Planning to try it on our Anniversary. but this time with added ingredients suggested ny others. Hi Aj, I’m, happy that you loved the tuna carbonara dish! Thanks for your comment! Some people dont use their common sense, they just open their mouth without thinking at all.All kinds of recipes has its own variation.And it depends on you howto cook it in your own way.. Anyway, Sir Manny i love all your recipes.. Keep it up! God bless. Hi Joys, thanks for the kind words. I agree with you because every one has different tastes and ways of cooking. I do not have magic sarap. Any substitute? Thanks. Hi Myra, you can use Lucky Me NamNam or MSG. Hi Majeed, yes the 300g for nestle cream and 289g can be used.